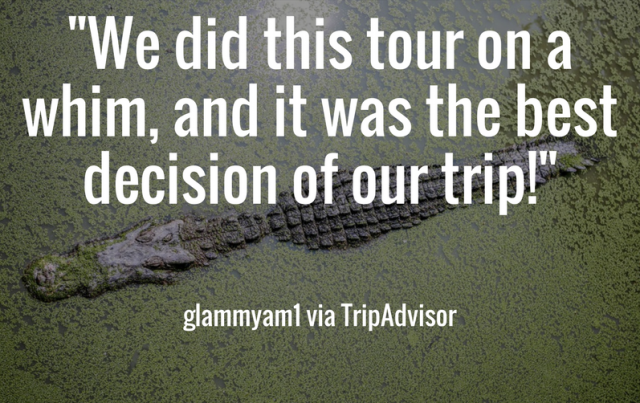 Big Passion For The Big Easy: Gators and Ghosts is a small, locally-owned and family-operated tour agency with a passion for all things New Orleans. Our guests consistently leave us 5-star reviews because of our expert advice about New Orleans tours, friendly customer service and because we send them on once-in-a-lifetime experiences that they will absolutely never forget! Call 888-481-8188 for reservations and more information. Find our FAQ Page Here. Roger Bell, our lead salesperson, has spent more than two decades in the tourism sales industry. You'll find him working at our booth at 500 Bourbon Street most mornings. Tell him you saw his picture on our website! Can be a rough estimate. We will get back to you as soon as possible. For faster service, please call 888-481-8188 between 8 am and 10 pm central time. You can always book online 24/7. Co-owner Charlotte Crist came back to her native Louisiana after Hurricane Katrina to help economically rebuild New Orleans. In 2009, she started the tour business located at 500 Bourbon Street that would later become Gators and Ghosts. Probably! Call us at (888) 481-8188 to discuss group discounts. Absolutely. We work every day at 728 St. Louis Street and at 500 Bourbon Street, both in the heart of the French Quarter. Our hours are usually 9 a.m. to 8 p.m. daily. In fact, we sell many other tours at our retail shops that you won't find on our website. We work with most of the top tour operators in the New Orleans area. If there is a specific company you would like to be placed with, please let us know. We go on tours all the time and can recommend the right one for you. She is a New Orleans legend who has been performing on Bourbon Street for years. She leads a variety act where she sings and dances (boy can she go!) every Friday and Saturday night at 9 p.m. at the Chris Owens Club, 500 Bourbon Street. It’s a $20 cover charge and includes your first drink. Picture Cher and Tina Turner taking over the Love Boat and you get an idea of what happens during the Chris Owens Show! It's a lot of fun. You'll laugh. You'll dance. You may well end up on stage or in a conga line. Tour deposits are non-refundable if cancelled by the guest with less than 48 hours notice before scheduled tour time. Groups of six or more must give a week's notice. Tours cancelled by the tour operator are always refundable. In the event your preferred tour time is sold out, we will happily reschedule you. If we can't find a time that works for you, we will of course issue you a full refund. FOR GROUPS OF 6 GUESTS OR MORE: You will be subject to a cancellation fee equal to 50 percent of the total tour cost if you cancel with less than 48 hours notice. Because more spots are held aside for large groups, it is much more difficult for us to fill them last minute. You will get credit for any deposit you may have paid when calculating the cancellation fee. You can read our full refund policy in our Frequently Asked Questions.